Toyota will start manufacturing hybrid cars for Suzuki at one of its UK factories, it has been confirmed. The plant in Burnaston, Derbyshire, is part of a global deal to share resources, which was announced by the car makers. 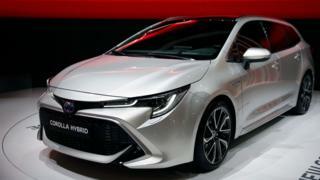 Based on the Corolla, the new car will have engines made in Wales and electrical components from Japan. It will not lead to extra jobs or investment but will make the factory more efficient, the firm said. Toyota's UK managing director Marvin Cooke said: "This is good news for our UK plants and demonstrates Toyota's trust in the capability of our workforce to deliver the highest levels of superior quality products. "Seeking to produce additional volume for other customers is one example of all the efforts we are making to keep our UK manufacturing operations as competitive as they can be." Manufacture of the new model is expected to start towards the end of 2020. Earlier this month, the head of Toyota's European operations, Johan van Zyl, said Brexit "hurdles" potentially risked future investment. In February, Nissan reversed a decision to build a new car in the UK and Honda said it was closing its Swindon plant, although both cited non-Brexit reasons. Toyota began building cars in Burnaston in 1992 and recently spent £240m upgrading the factory, which currently makes the Corolla model. The company currently employs more than 3,200 people in the Derbyshire factory and in Deeside in Wales.